I'm labeling this recipe as 'anything goes' because of its simple versatility, and the fact that it's one of those "anytime" meals, much like breakfast served all day. Taken more as a template than a standard, you can have a lot of fun with this, changing up everything about it: the grains, the vinegar, the fruits, the nuts, the quantities. In addition to the ingredients listed below, I personally recommend experimenting with wild rice and oranges, as well as Israeli couscous with apricots and almonds. The recent rediscovery of how wonderfully this salad fits into routines at our house has a little bit of a back story, to which I'm about to devote a rambling explanation. But given my habit of following beckoning tangents, for those other than the 1% of you who might be interested, thanks for stopping by, and please skip ahead to the recipe! So, I originally wrote this recipe to accompany a Natural Solutions article. I can't remember the focus of the piece, and ultimately this wasn't one of the selected recipes for inclusion, so I think I mentally shelved and forgot about it. Then, a few weeks ago, my husband and a mutual friend (I really want to say 'buddy'...Charles, if you're reading, that word suits you really, really well, for some reason!) decided they were going to host a small gathering at our house to watch the Tour of Flanders bike race. In acknowledgment of my propensity to go overboard with prep when it comes to providing for guests, they emphatically stressed that this was their deal; they were buying pizza, it was just a few people, and I wasn't supposed to do any cooking, period. It was a very nice gesture, and for the most part I took them at their word. Then, morning of the race, we finished our long run a few hours before people were coming over, and I asked Dave what he'd planned. I knew who was coming, and it was a bigger group than I'd originally thought, but that was great (because we really liked everyone, of course). "So, what do you have for people?" I asked. "We're getting pizza," Dave answered in that logical fashion that denotes the question was essentially rhetorical. "No, seriously, what do you have to go with it?" I persisted. At this point, my poor husband appeared genuinely confused and even a little hurt. "We're getting pizza?" he responded, this time with a hint of hesitancy. I'm not going to exaggerate to say I was incensed, or livid, in spite of those being fairly fun words, but I was seriously horrified. There were GIRLS coming over, plus a couple we'd never hung out with outside of training before. And, our friend Laurie eats largely gluten free. I don't mean to sound chauvinistic, but really, you can't invite women to your home and only order pizza, at least not by the time you're our age. My husband is a planner, and one of the very most detail-oriented, dependable, and intelligent people I know or have ever met even, but when it comes to anything related to the kitchen, he hasn't really progressed out of college, which is when, OK, you can just order pizza for anyone. This, I realize, is because I enable him by taking control of cooking the way I gratefully let him enable me in bike maintenance and probably far too many other things to list. But I'm digressing, so, I'll wrap this up by saying that Dave did rally and pick up some fruit, I threw together a couple of salads, including this one, people brought stuff, and everything worked out fine. The next morning, I experienced the "anytime" part of this salad somewhat by accident. I woke up early to squeeze in a swim before work, and hadn't gotten breakfast-to-go packed the night before, like usual. Instead, I grabbed a zip lock of leftover salad and it was PERFECT post-swim/pre-work fuel, with its mix of whole grains, fruit, heart-healthy fat and a bit of protein. While I consider myself a careful, conscientious eater nearly to an extreme but not quite, I have to admit that more-or-less following Michael Pollan's Food Rules, even in a respectfully relaxed way, can be really, really tough. And it begins with breakfast, because I absolutely head-over-heels love cereal, and not always the very best kind! I've been trying, however, to be more consistent about starting my day with whole foods, and making a big batch of some version of this salad is one way I can be better about achieving that goal. *I like to go with red wine vinegar if using cranberry juice, or rice vinegar with orange 1. In a saucepan, cook brown rice in water. Bring to a boil, then simmer for 45 minutes or until tender. 2. Transfer rice to a bowl. 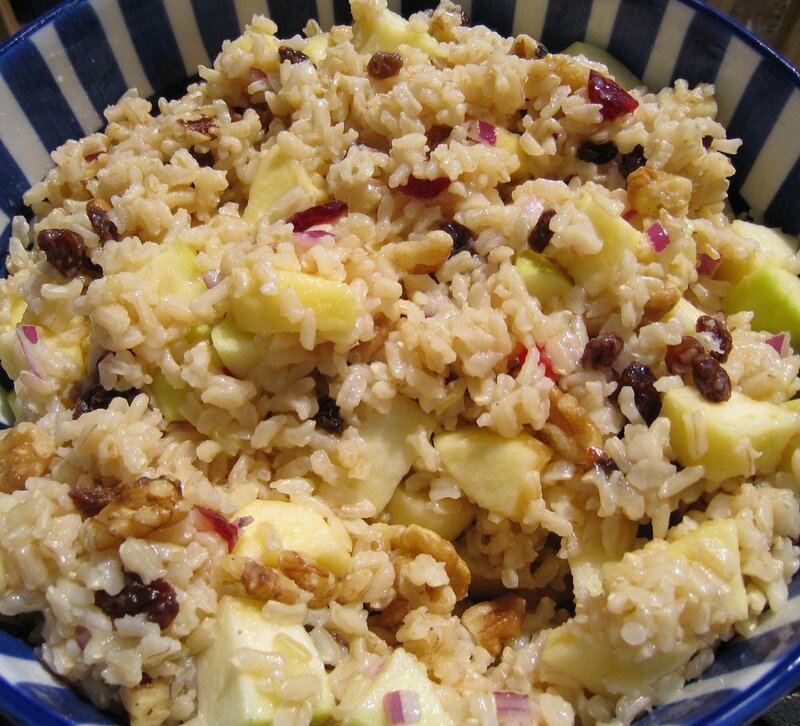 Mix in diced onion, toasted walnuts, apples, dried cranberries and raisins. 3. In a separate bowl, whisk together olive oil, red wine vinegar, cranberry juice, and honey. Pour over rice mixture and stir thoroughly. Chill and serve.